At the entrance of a hospital in Zhengzhou, Henan, Yan Zi Jun pushed his youngest son to the hospital for changing medicine, and his eldest son was singing for money in front of the hospital.In order to cure two children, Yan Zi Jun spent all his family savings.A couple of years ago, his wife was divorced from him. The family now only left him and two children together. This three family members were very noticeable at the entrance of the hospital. Yan Zi Jun is 46 years old. His older sons is called Yan Shi Jie, is 13 years old. His younger brother, Yan Liang Yan, is 7 years old.They all suffered from rare “rickets”, also known as porcelain doll disease.Children suffering from this disease are physically incompetent and unable to withstand any collision. A slight vibration may cause fractures.Yan Zi Jun took these two children away from his hometown Dancheng County, and ran around all the major hospitals throughout the country.Up to now, it has spent hundreds of thousands of children to see a doctor,nothing in the house is worth a bit of money.And foreign debt about one hundred thousand. Yan Zi Jun said, the disease of the eldest child is too serious to cure.If the second child can be treated in time, he will walk himself in the future, and he can take care of himself in life.But many operations are needed to correct the disease. Each operation is more than 40 thousand, and at least four operations are performed.Now Zhengzhou River medical university can not do this operation, he can only take children to Tianjin Hospital for treatment.This time the nail on the Yan Liang Yan ‘s legs quickly come out ,Yan Zi Jun once again brought his child to Tianjin for surgery. This is the sixth time for the child to do the operation. Cause Yan Zi Jun had to earn money by working odd jobs near the hospital,the 7 year old Yan Liang Yan was often in hospital alone. After the operation, the child recovered very quickly, and the sensible Yan Liang Yan was hungry and ate his own steamed bread that his father put on the head of the bed. After left hospital, the father and two son from Tianjin back to the house rent in Zhengzhou.Yan Liang Yan could not sing with his brother because the weather began to heat up and the wound was inflamed. After surgery, Yan Liang Yan has to give Zoledronic Acid for Injection a needle every month, 380 yuan per needle.The calcium tablets are five boxes a month, 60 yuan per box.Every 10 days, he should go to the hospital to clean up the wound and change the medicine. Outside the hospital after changing medicine, sensible Liang Yan will also wipe sweat for his father, Yan Zi Jun watched the children suffer a lot, heart cut like a knife.He said that the child’s mother abandoned them,life is difficult I still to find ways to earn money for children to see a doctor. Now, the remaining brother Yan Shi Jie, is singing and making money on the street. 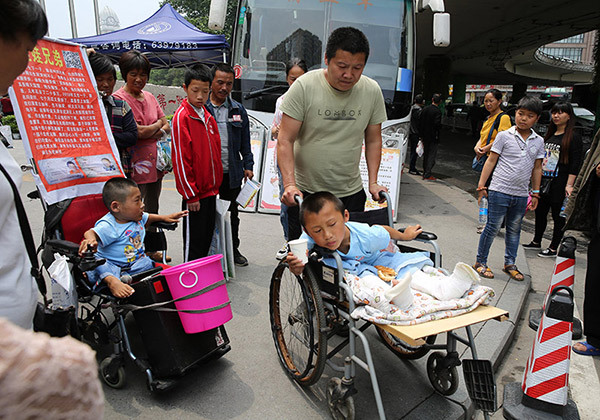 Because all two children need Yan Zi Jun to take care of him all the time, he sweeps the floor near the hospital and carries cement sand to load the truck, earning 30 yuan per hour.Yan Zi Jun said that the two children could not live without him. He could not leave the work for too long, so he could not find a job, but he would do anything if he could make money. The treatment cost and other management expenses is total: 50000 dollars.